that take a hit on our vitality. hobbies, I'd say, it is definitely still worth the effort. A young couple moved in across the alley. while and I'm closing with laughter and happiness. a fun journey through the alphabet with you. Manziii, i am here!! Am i so slow or is it the alphabet which is so short?! )) I'm just so busy with everything these days, so i've been failing to find enough time for computer. Anyway, i am back, now for reading and soon for blogging again! Well, i never heard of fulvic acid, and i am not sure if i can find it in my place. What brand do you use? You are so right, joy and hobbies are always a very powerful motivation! Are the clock's hands moving faster or have they removed some hours because I too, have no time ...... especially in spring. But never fear, you are always in my heart. The Fulvic Acid I have is made by Optimally Organic out of California. You probably couldn't get that brand. Snail's pace. Yes I know. It often feels like we're going backwards. We should show down a little, huh. This is the end of the A-Z and i've been terrible about keeping up. I hope you wil be able to plant a garden this year and enjoy all the beautiful flowers you love so much. p.s. still no real piece of land, but we have 2 balconies. I saved life to 5 strawberries only. They are happily growing, but i'm afraid to do anything wrong to them. )) Seeds of asters, tomatoes and peppers didn't sprout at all. ;/ So we are going to buy lots of flowers ready to bloom and arrange our lounging areas with them. Will show pics, of course, once it gets a desirable look. I always enjoy your posts since we are 'so' into vitamins/supplements--in order to stay healthy and to stay OFF of Prescription drugs... I keep hearing about MSM---but haven't checked it out yet.. Think I'll do that. Thanks! I have a 'heavenly' post today. Check it out --if you haven't yet. How wonderful are those photos. I was at your post and the flowers are life-like. But thanks for pointing it out. I would hate to have missed it. You are the wise woman, we are the students, sitting at your feet learning, absorbing. Great posts, each one packed with information. Thanks. 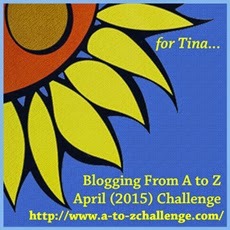 Another A-Z challenge to our credit. Congrats to you on your fun but yet "teaching" posts. Thank you so much for your support. It means a lot to have a friend like you. I've never heard of fulvic acid, but I will check up on it. I couldn't remember what you said about MSM, so I revisited that post. Seems like you use a salve form, but it seems like I've seen it in a pill or capsule form. I've had both but right now the one I'm using (when I use it) is the powder form. I'm getting there, this time around. The new hydrotherapist was taking her 90 year old mother to someone for the ozone treatment today. I didn't know we had any of them here and neither did she ...... before, that is. Another A-Z down the hatch. Here's to the finish line and most of us made it. Young neighbors are wonderful. At first I wondered, as there were 5 houses right around me that were recently sold. This is a good thing because they all want to take excellent care of their house and lawn. Many of them know nothing about flowers and gardening but they've come to me for advice. Not that I'm any expert but I'm willing to share my knowledge and my flower cuttings. Oh no, it is Z all ready?. How quickly that went and how much I have learned. Yes you are right, the older we get the higher maintenance we become. Your new neighbors came to the right place. Right on. We're not much different that an auto. We all need a bit of young blood around. The zeal of zeolite dizzzolves zee calzzzium. I'm feeling quite punchy, can you tell? I went too crazy at the free gym last week and this week I'm paying for it. I didn't think I overdid it, but all the pains in my joints have been protesting. Such is life. I shall rebalance myself yet. I enjoyed your series. You've given me much to consider, as always. Well, we did it. Yay Can't get too silly, especialy on the "Z" day. I enjoyed your "Letters" and all your famiy photos. Thanks for supporting me, too. "staying healthy by eliminating toxins"
but some people seem to live forever and haven't done a single healthy thing. they smoke they drink they eat fatty foods, then they're on TV with birthday cake and celebrating their 100th year! I guess it proves that genes matter so ya gotta choose good parents. Thank you, River for supporting me with your wonderful comments during this A-Z. I always look forward to your logical explanations. Like the young couple I've learned a lot from you, too. Such as..."zeolites" aren't something from Star Trek. You jest. What do I know? I'm from that school of Hard Knocks.... like Little Orphan Annie. You might just notice I've popped in at the sort of end to yet another year of alphabet mayhem, Manzanita. Good thing there isn't reflection posts about the alphabet challenge. That would be just too much, eh. I shall have to also move in near you. You could teach me all about healthy stuff from A to Z. But it's nice to see you out and about on this warm spring day and I am enjoying your A-Z visit. It's such a pleasure to see you again. To have a body free of chemicas and toxins would be a heavenly dream. Of course there's a big but, It wouldn't even last the day....unless........unless one lived far, far, far off the grid.....but then we have that poison falling from the sky. Nope, I guess we've allowed our perfect world to evaporate. Your posts are always filled with zillions of wise suggestions for all of us. Thank you. Thanks for the visit and the kind words. MSM as well as borax are on my list . Cocoa powder and red chillies too. We cannot do enough for our bodies. Walking is also a must do! I'm glad you took this journey and feel happy with your outcome. Thank you for visiting. We all seem to have our own "pets" for good health in our cupboards. You hit on some very good essentials. I agree with all. Congratulations on surviving the A-Z Challenge! I didn't get to visit your blog during the crazy month of April so I'm popping over today from the Road Trip. I have lived a long and neat life. No more bucket list because I've done everything I want to do. I just want to stay home and hang clothes outside on the line. I still teach a little dance in my wonderful studio with the gorgeous floating floor. I sing all day long because love in Montana reigns supreme and people in my family just can't help singing. And Don't We All Wish We Had A Basket To Hide In Now And Then? New Ebook! Forever After Trilogy of Fantasy Romance Novellas Out Now!